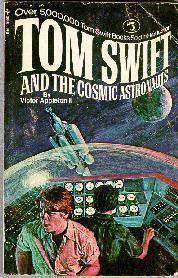 Watch for the next spine-tingling adventure of Tom Swift Jr. which will be published soon. The summary below was written by Graeme Woods. Thanks for volunteering! The space kite is the most important invention in this book. There are actually two versions of the space kite. 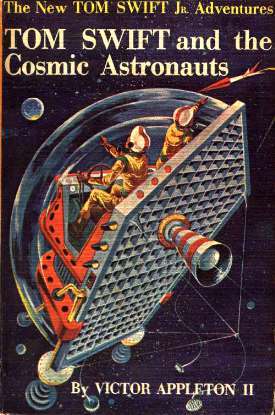 The prototype 2 person dome shaped version is shown on the cover, while the final version, christened "Cosmic Sailer", is shaped like an egg and can accommodate 8 astronauts. How does the Space Kite work? The space kite uses cosmic radiation as a power source. It uses a rocket to launch itself above the atmosphere to where the cosmic radiation is intense enough to provide thrust. He waved good-by and resumed his homeward stroll. He found himself wondering if the boysí dreams would ever come true. "Not if we canít beat the cost factor in space travel!" Tom reflected ruefully. "Kite flying is sure cheaper!" Kites! The word exploded in Tomís mind. He stopped short as an exciting idea struck him full force. Instead of regarding cosmic rays as a dangerous drawback to space flight, why not make use of them just as a kite makes use of the wind? "Iíll build a brand-new experimental craft on this principle," Tom thought elatedly, "and even call it a space kite!" But first, Tom realized, he would have to develop a revolutionary device for utilizing the cosmic rays ñ a sort of cosmic reactor to convert the rays into a usable force. This force would move the spaceship, just as the wind moved the boysí kite aloft. "A spaceship propelled by cosmic radiation?" Mr Swift was at once startled and intrigued. "And yet, why not Tom, I believe you have a really promising idea there." Then the scientist frowned. "The only trouble is youíd need still another source of energy ñ something to provide a force for the cosmic radiation to react against. In other words, something to take the place of the kite string on an ordinary air kite. Without such a device, your craft would drift out of control." "My gravity concentrator will make use of the attracting force between objects, rather than the repelling force," Tom added. Tom reflected that gravity can be considered as a form of radiation even though its nature is not yet clearly understood by scientists. "But Iím sure that my device will be able to concentrate the strength of radiation by electromagnetic action," he said to himself. First, Tom shaped the direction cone of his gravitex on a metal spinning lathe. Next, he moulded a number of lightweight plastic balls and removed the air inside them with a vacuum pump. He then wound the balls with many turns of fine, insulated silver wire, just as if he were winding up balls of knitting wool. "Guess Iíll call these gravitol spheres," Tim decided, jotting down this name on his working sketch. The spheres were mounted around the neck of the direction cone, then connected by cable to the electronic component through a power control unit. When power was turned on, the electricity would flow through the fine silver wires and create a rapidly rotating magnetic flux inside the gravitol spheres. The design of the space kite was beautifully simple. The pilot and copilot, with their control board, would be enclosed in the front part by a plain transparent plastic dome. Behind their seats, the dome was partitioned off by the flat "screen layers" of Tomís cosmic reactor ñ the device for converting cosmic radiation into motive power. From the center of the reactor, a cone protruded out behind like a stubby cometís tail. This was to be the directional-aiming cone of the gravitex. "The cosmic rays will enter the screen layer, the pass into the injuster layer, and change velocity in the vacuum layer," Tom began. At this point, he continued, after the radiation had entered the central part of the machine, flexatrons would absorb the energy of the cosmic rays ñ thus giving the whole assembly a "push" in the same direction as that in which the rays had first been moving. "Now notice this smaller housing at one side of the reactor," Tom pointed out. "Whatís it for?" Bud inquired. "That will be the direction converter ñ narrowing into an output vent," Tom replied. "This gadget will bypass the cosmic radiation, so to speak, whenever we donít want any more ëpushí on our kite. Or we can use it for ëdraining offí part of the radiation when the input is too great." The prototype version is launched on top of a rocket as high as the ionosphere. However when Tom and Bud encounter a cosmic storm, the craft is blown out of control as the gravitex canít hold it against the surge of cosmic rays. Tom eventually regains control of the craft by operating the direction converter to bypass the extra thrust from the cosmic rays. Since the craft is very small and has limited oxygen and water supplies, they need to be rescued by the Challenger. "Okay, pal," Tom said. "In flight these radiation emitters will produce an invisible keel of force." The pilot, he went on, would be able to swivel the ring with its emitters in any direction, on pivoted bearings. Thus he would have a counter-force with which to oppose the cosmic "wind" pressure. Tom explained that this would enable the pilot to "tack" or steer anywhere in space, rather than just drift downwind as the space kite had done. "Iíve designed it, Dad, to carry as many as eight persons," Tom explained. "The control cabin will be up front, with another compartment and observation port at the rear, joined by a connecting passageway." The screen layers, through which cosmic rays were absorbed into the reactor, would be located at the top and on each side of the egg-shaped fuselage. The ring would be mounted upright on a flat, rectangular metal landing deck, with an atomic auxiliary rocket at each of its four corners. These rockets, Tom added, would be used to lift the ship above the earthís atmosphere to an altitude at which cosmic radiation would be strong enough to operate the craft. The atomic rockets are also used to slow the craft for re-entry and landing. This invention is an application of the gravitex developed by Tom for the space kite. They are mounted on each side of a boat or shipís hull to stabilise a craft in rough conditions. They are initially installed on the Sunspot, where they keep the ketch upright when it is hit by a sudden gust of wind. Once Tom sees the invention in action, he believes that it would be an ideal product for ships. The Sea Charger is a recently constructed experimental ship that was stolen by Li Ching and his henchmen in the beginning of the story. Overall it is a minor invention compared to the space kite. The Sea Charger, the Swiftsí latest ocean-going experimental ship, had only recently been built and launched. Far surpassing any other scientific craft afloat, it had a fully equipped laboratory, a runway deck for planes, and a unique cable drawn launching pad for space vehicles. The pictures of the Sea Charger show it to be similar in appearance to an aircraft carrier with the launching pad alongside. The Sea Charger is described as being atomic powered with an atomic pile driving a generator that is similar to many military ships. This invention is quite technically feasible and nuclear powered aircraft carriers and other large ships use similar technologies, but for military rather than scientific applications. Would the Space Kite work? The space kite relies on cosmic radiation as a motive force but the book is actually quite vague on how the energy in cosmic rays is converted into force using "flexatrons". Cosmic rays mainly originate from outside the solar system from sources such as black holes and supernovae, although the sun emits cosmic rays of low energy during solar flares. About 87 percent are protons, while 12 percent are alpha particles, and the remainder are light elements. The average energy density of cosmic rays in our galaxy is about 1 electronvolt of energy per cubic centimetre of space, although particles up to 1011 GeV have been detected. Since cosmic rays are high velocity charged particles, it should be possible to convert them into electric current. However, I donít believe that it is practical to use cosmic rays to propel spacecraft because the power density is too low. To leave the earthís orbit, a spacecraft must be accelerated to an extremely high velocity, requiring a lot of energy. I donít believe that enough power can be obtained from cosmic rays and converted into motive force to achieve this. The implication in the book is that the space kite captures cosmic rays in the same way that a sail harnesses the wind. The gravitex and "keel" keep the space kite oriented correctly to the cosmic rays to allow control. However cosmic rays do not travel in the same direction like the wind does because even a weak magnetic field moves them from a straight-line path. The interstellar magnetic field prevents cosmic rays from coming to earth directly from their point of origin and the directions of arrival are isotropically distributed even for the highest energy particles. This means that the concept of "tacking" or using the cosmic rays like a sail uses the wind is not relevant, although craft have been proposed that use sails to harness the solar wind. Iím interested in the way the book links electromagnetic and gravitational forces, but I donít believe that the gravitol spheres or the gravitex would work. These are described as generators of electromagnetic flux, which is used to concentrate the strength of gravitational radiation. Motors and transformers are built in a similar fashion, but without any observed effects on gravity. Until a unified field theory clearly links electromagnetic and gravitational forces, we are not likely to see a working gravitex. Incidentally, the gravitex is similar to the controversial work by Dr Townsend Brown. He discovered the Biefeld-Brown effect, which is the tendency of a capacitor to physically move towards its positive side when charged. He postulated that this was in fact evidence of a link between electromagnetic and gravitational forces. The jury is still out on his conclusion, although the effect is readily reproducible in a laboratory. In summary, I donít believe that the space kite could work as described although it is an interesting and original idea. What impact would the space kite and associated inventions have on our lives? Early in the story, Tom highlights the major drawback to further exploration of space ñ cost. Even advances in space travel such as the Space Shuttle have not significantly lowered the cost of getting into space. The cost is related to the enormous amount of energy required to counteract the Earthís gravitational pull. The space kite would allow unlimited space travel without having to carry large amounts of propellant since cosmic rays are ubiquitous once above the atmosphere. This invention could make everyday space travel a practical proposition. Manned travel to Mars and exploration of the outer solar system would be far more cost effective than is currently the case. Once above the atmosphere, the space kite would use free cosmic rays to power itself into space and leave the Earthís orbit. The ocean-going application of the gravitex, the gravitex stabilizers would make ocean crossings smoother, although I understand that large ships already use gyroscopes to help stabilise their hulls during storms. A working gravitex would open up space travel using antigravity and would even allow light structures to be anchored to the ground without foundations. This would have enormous implications for all types of transport and construction.